Studios Apartments Perivolos is located in Santorini in village Perissa and offers a very pleasant accommodation suitable for all types of traveller, near the largest and most beautiful black beach of Santorini. This whitewashed building of typical Cycladic style is located in a quiet area of Perissa, just 150 metres from the beach. 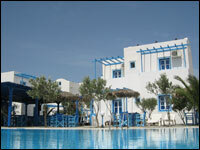 Consisting of 10 studios and 6 apartments, the resort offers a bar, breakfast room, swimming pool, gardens and parking. There is vibrant night life 250 metres away from Perivolos beach with bars, restaurants, a water park and disco. 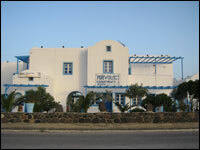 Fira Town and Santorini Airport and both just 10 minutes' drive away. Also available is free transportation to and from the port and airport.